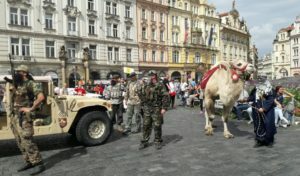 Sporting detachable beards, the men drove a Humvee onto Old Town Square in Prague on Sunday, wielding fake submachine-style BB guns and waving an Islamic State flag. Accompanied by a camel and a goat, they shouted “Allahu akbar” and fired guns without pellets. “We are bringing you the light of true faith,” the leader of the men, Martin Konvicka, who was dressed as an imam, told the crowd. Mr. Konvicka is an anti-immigration activist, and his stunt — which had been preapproved by City Hall — was intended to sound the alarm about what he views as the threat posed by Islam to the Czech way of life. But he evidently did not anticipate how it would be received. Prague is one of Central Europe’s most visited destinations; tourists throng the medieval Old Town and neighboring Josefov, the historic Jewish quarter, and nearby landmarks like the Charles Bridge and Prague Castle. Gun laws in the Czech Republic are generally less restrictive than in most other parts of Europe, and Josefov — whose synagogues and cemetery survived World War II because the Nazi occupiers intended for the quarter to become a museum of the extinct Jewish race — is, like many Jewish neighborhoods in Europe, carefully guarded. The act over the weekend was halted before it got to its planned end: The simulated killing of a prisoner, dressed in an orange jumpsuit, in the square. Not all tourists were sent into panic. Mr. Konvicka, an entomologist at University of South Bohemia in Ceske Budejovice, in the country’s south, founded a group called “We don’t want Islam in the Czech Republic.” He had called the protest “The Occupation of Prague” and scheduled it for Sunday, the 48th anniversary of the Soviet-led invasion of Czechoslovakia in 1968. On his Facebook page, he called the operation a success. “Until a few Muslims started shouting aggressively and pushing toward the performers, everything was going very peacefully,” he wrote. A spokesman for the Prague police, Tomas Hulan, said the department had no power to ban the event as it had been approved by City Hall. He said officers had questioned eight people and were looking into whether anyone could be charged for disturbing the peace. The Czech Republic, like other countries in Europe, has been grappling with fears about Islamic terrorism that are being exploited across the political spectrum. This month, a 25-year-old mechanic and loner from a small Czech town, who tried to travel to Syria in January, was charged with attempted terrorism, in what the authorities said was the first known case of a Czech citizen’s trying to join the Islamic State. The case stirred anxieties that homegrown Islamic radicalism may have migrated to Eastern and Central Europe. In the Czech Republic, such concerns have been fanned by President Milos Zeman, who warned last year that Islamic State jihadists must be crushed to prevent a “super Holocaust,” and who suggested that Czechs might want to arm themselves. The country has about 10.5 million people, with roughly 20,000 Muslims.